Emmanuel Macron’s victory in the French presidential election marked the end of the most contentious and polarizing election season in the history of the Fifth Republic. Macron and his independent centrist party En Marche! defeated Marine Le Pen and the far-right Front National (FN) on Sunday May 7, with Macron winning 66.1 percent of the vote. Voter turnout was the lowest France has seen since 1969 and almost 9 percent of voters filed blank ballots, an indication of voters’ widespread dissatisfaction with the candidates – and with the French political system at large. Both final candidates were from non-establishment parties, marking the first time in modern French history that neither the dominant leftist party, the Parti socialiste (PS), or the dominant right-wing party, Les Républicains (LR), were represented in the second round of voting. Macron founded his En Marche! movement in April 2016 and Le Pen took over her father’s far-right – and arguably bordering on neo-fascist – Front National party in 2011. Both parties departed from the traditional center-left and center-right orientation of the major political parties in contemporary France, each claiming to offer new solutions to the problems of economic stagnation, terrorism and the perception of France’s declining influence on the world stage. While Macron emphasized his hopes for a new future for France, a future based on increased economic competitiveness and further integration with Europe and the world, Le Pen focused on the fears of the French people. She did especially well in areas that suffered from high levels of poverty and unemployment caused by deindustrialization and those that have faced a perceived increase in the presence of immigrants and refugees. Although support for Le Pen was lower than the polls predicted, the FN received more votes than ever before in its history. When Le Pen ran in the 2012 Presidential election she came in third in the first round, winning 17.9 percent of the vote. 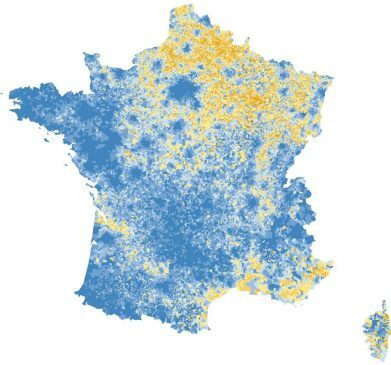 The results of the 2017 election reveal that 35.4 percent of French voters voted in support of the FN and in favor of a candidate who advocated for the removal of France from the European Union (EU) – a huge blow to European integration efforts and the democratic legitimacy of the EU in France. France’s role as a founding member of the EU – and the second most powerful and influential nation currently in the EU – makes the far-right’s call for the removal of France from the EU equitable to a mandate for the dissolution of the EU as a whole. Macron’s support for the EU and for France’s continued participation in European integration led to his endorsement by of a number of European leaders, including Angela Merkel, the current Chancellor of Germany. Macron also received a public endorsement from previous United States President Barack Obama, who posted a video on Twitter that ends with “En Marche! Vive la France!” Obama has long garnered support from the French people and remains very popular in France, while Trump, who has spoken favorably of Le Pen, remains extremely unpopular in France, even among members of the far-right. Macron’s platform focused on promoting globalization and European integration through maintaining the EU while also emphasizing the need for reform at the European-level, particularly in terms of increased efficiency and a higher level of democratic accountability – critiques that the EU has faced continuously since its conception. “I think he’s going to focus on the Franco-German partnership and close relations with Angela Merkel’s government and trying to make the EU work more effectively,” Harvey said. “Whereas Le Pen had talked about pulling France out of the EU and out of NATO, Macron will be looking to work through multinational organizations to make them work better and to secure benefits for France. The Franco-German partnership has been at the core of European integration from the very beginning, and I think that if Le Pen had won that would have been damaged – perhaps beyond repair.